LG was demolished after Samsung and HTC, turned to Android and gained the profit from the boom. But LG later followed up and this Korean telecom giant never gave up. They silently kept learning and launching devices and when they partnered with Google for Nexus 4 and later Nexus 5 they understand the key requirements of users and crafted almost all new handsets as per new quality standards. They have also developed their new User interface taking some features of Galaxy Note and HTC devices. The new LG Optimus UI is very fluid and paired with a device like LG G2 it beats almost all flagship devices in the market. AT&T Introduced LG G2 for its customer in September 2013 and till now there are lots of customers who are pretty happy with LG G2. When it comes to release the latest firmwares the Carriers are usually late. AT&T released a small update in December but that was to address AT&T Message and EAS issues, it also had some enhancement for Google maps and Ready2Go. There is no clear confirmation but leaks say that AT&T will be pushing out Android 4.4 Kit Kat to AT&T LG G2 devices in late March 2014. We are here to discuss about the custom firmware or the developer introduced custom ROM for AT&T LG G2. We have already tried and tested a dozen of LG G2 custom ROMs, but selected only few to rank on this page. Tips: Best apps to increase Android performance. SoniC Kang Project ROM for AT&T LG G2: AT&T LG G2 is a great device and with the new Kit Kat update it has become faster and snappier. But if you install a well optimized Android 4.4 Kit Kat based ROM you will get more kick out of your Phone. Based on Latest AOKP Android 4.4.4 firmware this custom ROM is designed by Sonic developers team. It is fully functional and stable ROM that supports multitasking, performance and optimum speed. There are inbuilt control system to customize UI elements and other settings. You can customize Clock, battery icon, notification bar, floating windows, Keyboard etc. Users who are using this ROM, have reported fluid experience and increased battery backup. Cloudystock ROM for LG G2: Cloudystock is based on Kit Kat released stock ROM for LG G2. It is running stock kernel but the developer has odexed and zipaligned the ROM for better performance. Beside that Aroma installer give you full control over features installation. The ROM is pre rooted with Busybox and runparts. The firmware is fully debloated and tweaked to perform wonderfully well on LG G2 hardware. Developer has included latest Gapps and Adaway host file in the installation. Energy ROM for AT&T LG G2: This a ROM build to have a stable, yet eye candy interface. The ROM is compatible both to AT&T and T-Mobile LG G2 variants. 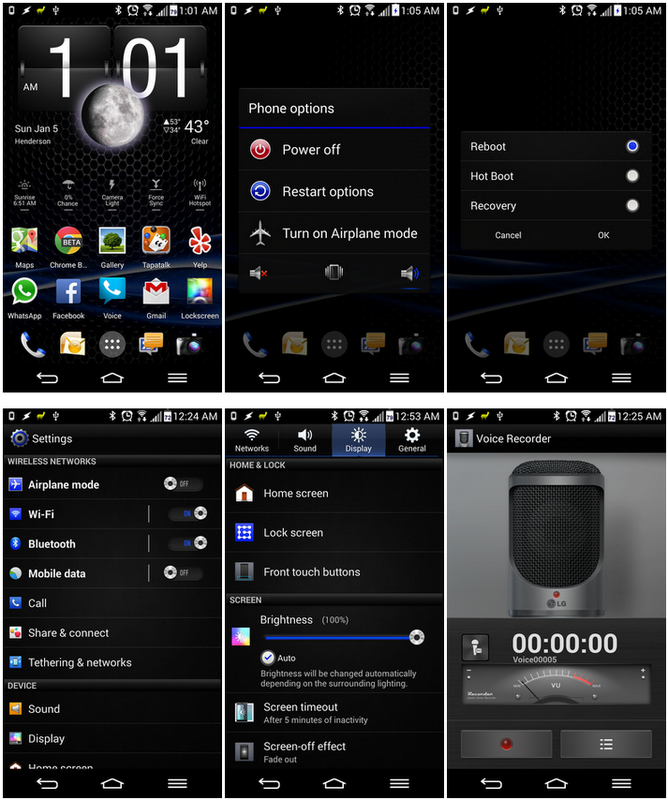 The ROM is mostly HTC themed, developer has removed the brightness slider, deodexed, zipaligned and tweaked. Carrier IQ apps have been removed and its fully debloated. There are lots of themed apps, tweaking and optimization. You will surely love this ROM running on your LG G2. 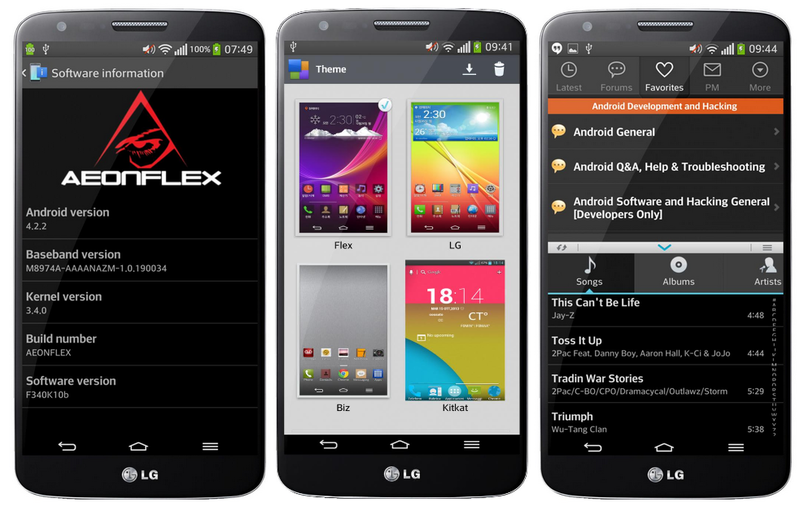 Flex ROM AEONFLEX [Base Android 4.2.2 Jelly Bean] : Based on the Koreon LG G Flex firmware, this Rom is prerooted and deodexed for better performance. Debloated and ADB enabled for better functionality and advanced access. There are lots of added features like Pie launcher, Xposed framework, YouTube app with download feature, advanced power menu. So you will love this ROM its stable, fast and feature rich. CyanogenMod Android 4.4 Kit Kat ROM: If you are looking for a Kit kat based custom ROM for AT&T LG G2 then CM11 is the only Stable version you can install. It has some minor issues which will be fixed in the coming weeks. For now, USB tethering is not working, Bluetooth start/stop leads to reboot. But still the ROM is working with all other calling and data features stable.